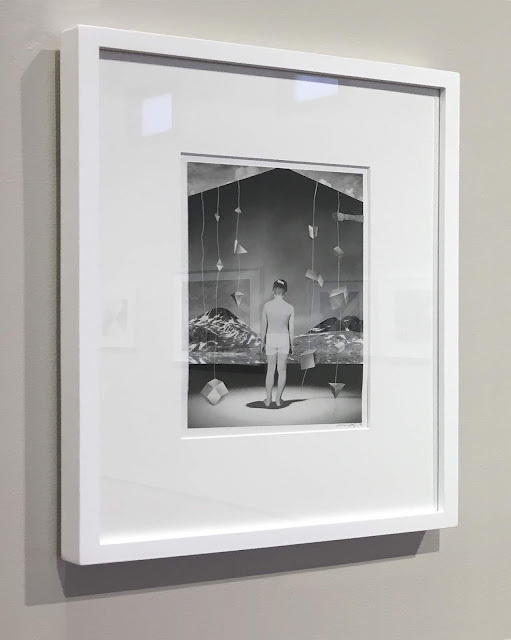 photo-eye Gallery is proud to exhibit unique collage works from Vanessa Woods' surreal series Somewhere Between Here and There in our current exhibition LIGHT + METAL. Utilizing original source material, Woods explores the boundaries of reality, loss, and memory by crafting layered dream-like psychological scenes. 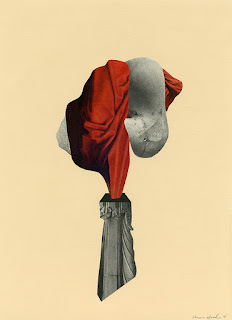 Woods' collages are a pseudo-collaboration with, and eulogy for, her late mentor Ken Graves. Gallery Director Anne Kelly first met Vanessa Woods at photoAlliance's Our World Portfolio Review and was immediately drawn to her seamless craftsmanship – the collages nearly appeared as digital montage as the elements were so convincingly assembled and affixed to the page. Always interested in unconventional and inventive artwork, Kelly also gravitated to the surreal atmosphere and symbolic nature of Woods' imagery where wonder, discovery, and apprehension converge to form compelling tableaux. We spoke with Vanessa inquiring about the inspiration behind Somewhere Between Here and There, why she creates unique objects, and her overall artistic influences. 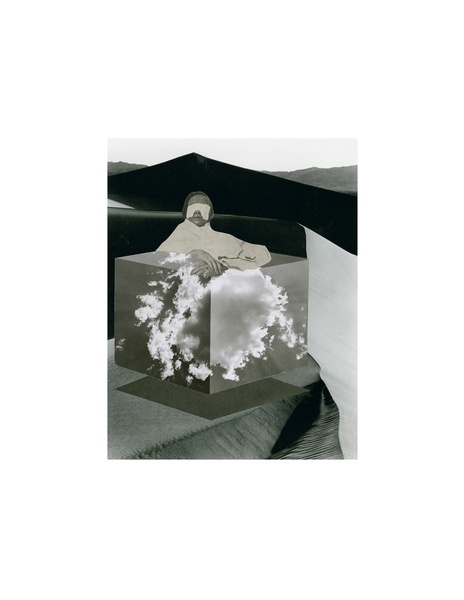 Vanessa Woods: The collages that are included in LIGHT + METAL are from a recent on-going series I am working on titled Somewhere Between Here and There. The work uses a treasure trove of paper material recently inherited from my deceased college mentor/photographer Ken Graves. After Ken died unexpectedly in 2016, his wife, Eva Lipman, gifted me with his collage materials. These materials included an extensive archive of clippings in index folders with categories like “interiors,” and “anatomy,” as well as physical materials such as feathers and beads, and finally, all the books/magazines that Ken had collected over decades of his life as a collage artist. I always adored Ken’s collage work and over time he had become a wonderful friend and generous mentor. We had many productive conversations about our work and ideas. After I was gifted Ken’s archive, it became clear how influential material can be to the vision of the artist and the collages that are the result. Ken’s archive had an extraordinarily specific aesthetic—a particular vision of masculinity that revealed a vulnerable male, and an affinity for material that drew from his 1950s childhood. I sat with Ken’s material for a good while before embarking on the series that would eventually become Somewhere Between Here and There. Working with the material was daunting to me because I had such big shoes to fill, and because it was particularly precious to me. In developing the work, I went through numerous iterations, or trial collages to arrive where I did. Early on, for example, I gave myself the parameter of making one collage from each index folder, but that led me to make work that looked too derivative of Ken’s. Ultimately, I began combining my own material with his and the work began to feel like mine, but also almost like a collaboration. I see this body of work as art elegy, part eulogy. In making the work I was interested in creating psychological spaces that invoke borderlands and navigate the places between dreams and reality, or the known and the unknown. I was also interested in playing with the idea of layers that can be pulled up or pulled apart to reveal other realms, (or what I imagine as set changes). This is something I always felt Ken’s collages processed. There are many references to artifice, theater, and illusion throughout the work. VW: I’m very committed to using only original material for my collages. I love the nuances of paper, tone, and texture that are found in original vintage imagery. I should also say that I love collecting material for my collages at flea markets, estate sales and such. When I make a collage, I like having the limitations of my material at hand. I know many people today are doing digital collage, but the possibilities in that realm are too infinite for me. I need boundaries to make successful pieces. pe: What type of work did you make prior to the work you are making today — And if the work was quite different what inspired the change? VW: I work across a variety of mediums, but have focused almost exclusively on collage for the past 6 years. Prior to collage, I worked primarily in photography and filmmaking, focusing on alternative processes and making 16mm experimental stop motion animations. Collage has been my primary medium since starting a family (I have three kids and work full time) because it works with my limited time and space. I still work in the medium of photography quite a bit too. In regards to collage, my previous body of collage work made from 2015-2016 was titled Emic/Etic. This work aimed to explore the complicated tradition of western ethnographic interpretation. Emic/Etic is a fictional dossier of an invented tribe. The book serves as the format in which I present anthropological study such as scale/size indicators, numerical systems, and invented maps create a fictional method of ordering diverse material. VW: I have many! 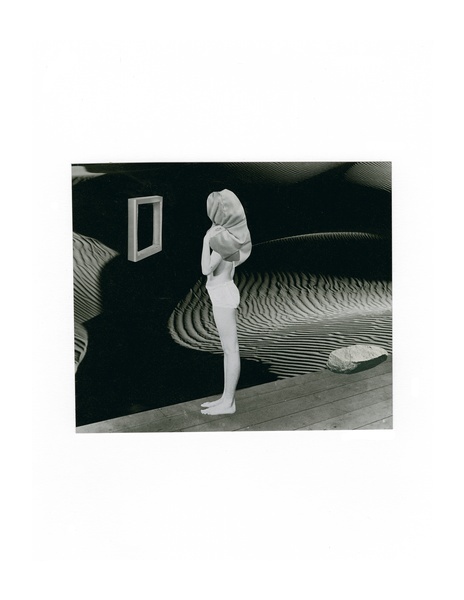 But to name a few: Hannah Hoch, Max Ernst, Lazlo Moholy Nagy, Ken Graves and Czech Surrealist Karel Tiege. VW: On the day of Ken’s memorial, I was working on a finishing a collage of a young boy (perhaps a stand-in for Ken himself) passing through a threshold. For some reason, that morning, I decided to place small stones all along the lintel of the doorframe that the figure in the collage was passing through. When my husband and I went to the memorial later that afternoon, Ken’s wife asked everyone to gather a pebble to place on Ken’s tombstone. This felt like such an uncanny coincidence! As it turns out, this is a Jewish mourning ritual, one that I was not aware of—that is meant to honor the deceased by letting people know that the gravesite has recently been visited. Of course, this moment really resonated with me, and after the fact, I went on to consciously place stones all throughout the collages in this series. Throughout Somewhere Between Here and There, stones populate the landscapes or sets, floating mid-air, being pulled by subjects or resting singularly on surfaces. You can see examples of such stones in the pieces Understudy and Do as I Do. The stones represent parceled griefs and memories of Ken. Vanessa Woods in her studio. 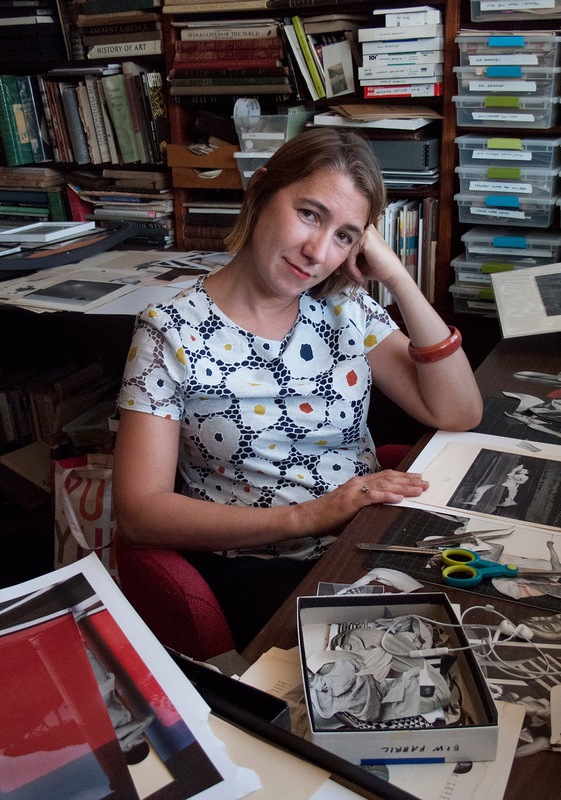 Vanessa Woods is a California-based photographic artist who received her MFA in Film/Photography from the San Francisco Art Institute in 2007. Woods has exhibited internationally including venues such as the San Jose Institute of Contemporary Art, the Berkeley Art Center, Kino Akademiesalon; Regensburg; Germany, and the Lerner Gallery, Columbia University, New York among others. 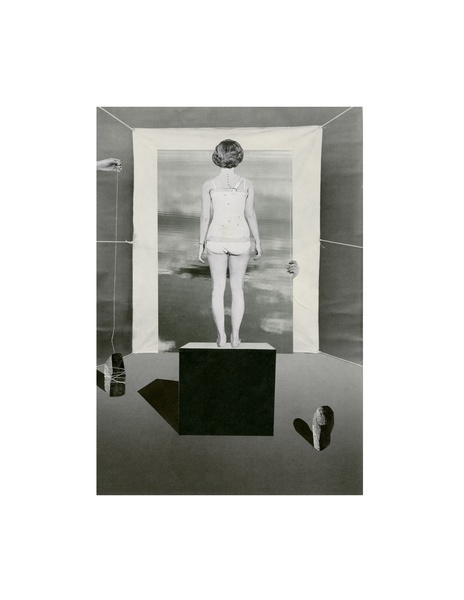 Her work is in the permanent collection of The Center for Fine Art Photography, Fort Collins, CO and appeared in Making the Cut, The World’s Best Collage Artists, Volume One, Crooks Press, Melbourne, Australia, March 2017. LIGHT + METAL is Vanessa Woods debut exhibition at photo-eye Gallery. 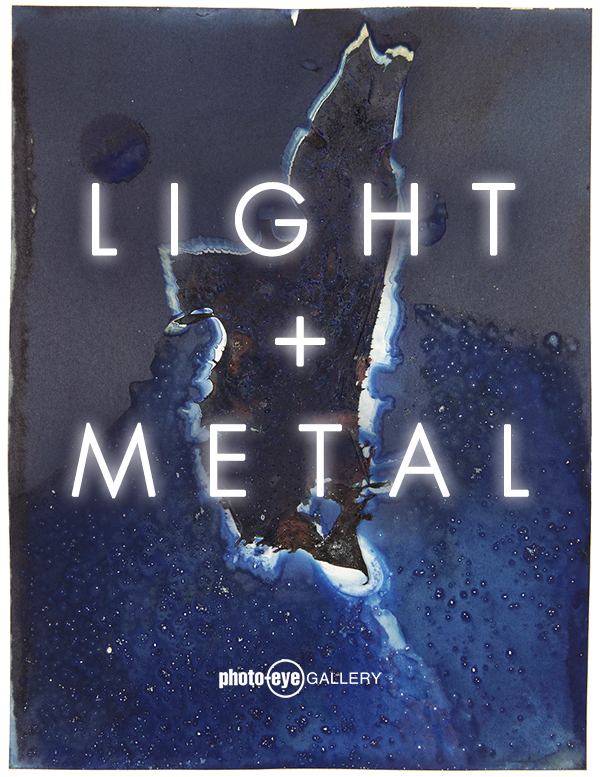 LIGHT + METAL is on view at photo-eye Gallery through September 15th, 2018. For more information about Vanessa Woods, and to purchase prints, please contact Gallery Staff at 505-988-5152 x202 or gallery@photoeye.com.